St. Peter’s Basilica in the Vatican is probably the most important and best-known church in the world. The cathedral from the 16th and 17th centuries is also one of the largest churches in the world. St. Peter’s can be visited almost every day. Admission is free, except for the ascent to the dome and the entrance to the treasury. A church had been standing on the site for a long time. The so-called Constantine Basilica (also called Old Saint Peter) was built in the 4th century. At the end of the Middle Ages this church was increasingly perceived as too small. They decided for a gigantic new building, whose construction time was over 100 years (about 1504 to 1633). Despite this long construction period, the new St. Peter’s Basilica was so expensive that many regions of the Catholic world at that time had to participate in the financing. In some areas of present-day Germany, the money was collected by indulgences (e.g. forgiveness of the sins of the faithful by payments to the church). The sale of indulgences was much criticized and was the most important statement of Luther’s 95 theses, which he made in 1517 at the church in Wittenberg. 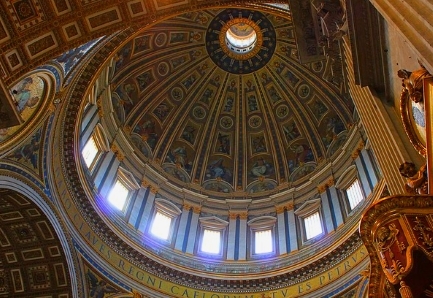 Thus, according to many historians, there is some connection between the construction of St Peter’s Basilica and the division of the church into Catholic and Protestant (Reformation). Tickets without queuing St. Peter’s: If you don’t want to queue for hours at the most important church in the world, you can book a ticket with preferential admission (without queuing) incl. audio guide online. Due to the long period of the construction of St. Peter’s Cathedral, many popes and builders were of course involved in the gigantic church construction. The two best-known site managers were the painter Raffael and above all Michelangelo. Michelangelo was in charge of the construction site of St. Peter’s Basilica for 17 years from 1547 to 1564. Above all, he designed the gigantic, famous dome. The area inside St. Peter’s in the Vatican is about 15,000 square meters, which is more than two football fields. The cathedral in Rome is „only“ the second largest church in the world. Even bigger is the „Cathedral of the Conception of our Lady“ in Cordoba (south of Spain) with a gigantic 23,000 m². However, this church was originally built as a mosque and later converted into a Catholic church. St. Peter’s Basilica in Rome is 132 meters high (dome). It is thus, magels church tower, not the highest church in the world. This is with 162 meters the cathedral in Ulm – the cathedral in the Vatican is however the highest dome of a church world-wide and the highest self-supporting building from brick of the earth. Visitors to St Peter’s Basilica can only enter from St Peter’s Square in the Vatican. On the right side of the large square you can see the queues of people waiting at the entrance. Depending on the season, the day of the week, the weather and the time of day, the queues are of different lengths. Even on a Wednesday in January we waited about an hour. 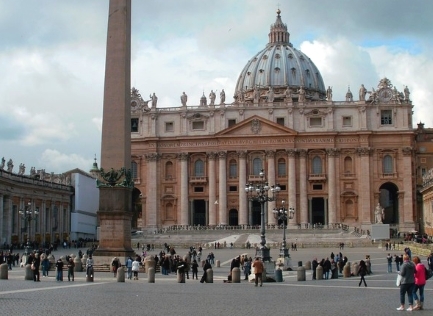 Very popular is also a combination ticket Vatican with museum and St. Peter’s Basilica. St. Peter’s Basilica is theoretically free, but there are very long queues. With the ticket you don’t have to queue at the church or at the cash desk in the museum. Bags are scanned like at the airport. You also have to walk through a scanner. As in a airplane, it is forbidden to take small pocket knives and glass bottles with you. You have the choice to dispose these things in a garbage can or not to go to St. Peter’s Basilica. I had to throw away my Swiss Army Knife and I didn’t get it back. Once you have passed the entrance, you first come to a room with a wardrobe and a toilet. The next room is the entrance to the dome, but you can also visit the church first and then the dome. The walk up the dome is already worthwhile because of the view to the city of Rome and the huge St. Peter’s Square. But those who are claustrophobic or afraid of heights or are not so good on foot should consider the walk to the dome carefully. The stairs are very narrow in the upper area, the possibility to turn around does not exist. We were overwhelmed by the gigantic size of the building and all the elements like the dome and columns. The basilica in the Vatican seems much bigger and more powerful than other world-famous churches. The highlight for most visitors is the view from below into the dome. You can walk around freely in St. Peter’s Church and also go into the sacristy. 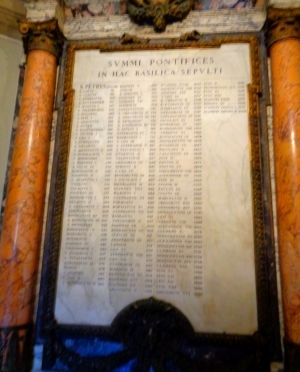 Behind the entrance to the sacristy is the famous list of popes (see picture). Also in the sacristy, as in all the main sights in Italy, is a shop where books, jewellery, postcards, etc. are sold. The shop has a slightly better than in other sights. The sale of tourist kitsch is largely avoided in St Peter’s Basilica. In the sacristy there is also the entrance to the treasure chamber of St. Peter’s Cathedral (entrance fee, see below). There is no passage to the large Vatican Museum. If you want to get there from St. Peter’s Basilica, you have to leave the church via St. Peter’s Square and walk along the wall of the Vatican to the Vatican museum (about 1 km). Some pictures from St. Peter’s Basilica are now in the Pinakothek of the Vatican, in the church are copies. Admission to the church is free. The entrance fee to the dome for adults is 6 Euro (in the beginning of 2019). The entrance fee to the treasury (Tresoro) is about 5 Euro. Prices and other data are from 2018, partly from the beginning of 2019. 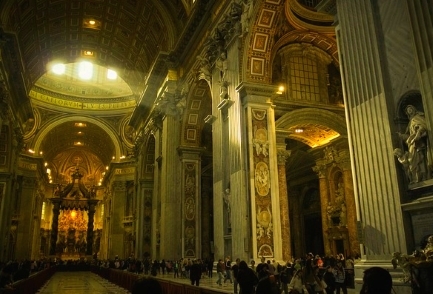 St. Peter’s Basilica is open daily from 7 a.m. to 7 p.m., in winter until 6:30 p.m. Very early in the morning is a good time to visit the church. Then there is much less going on. Most tourists come after 10 o’clock. In the tourist language English the church is called in the Vatican St. Peter’s Basilica, in Italian Basilica di San Pietro in Vaticano and in Latin Basilica Vaticana.